Singer David Osmond, from the famed talented Osmond Family talks about his gig hosting the Daytime Emmy Creative Arts Awards. Jill Cody, co-author of Climate Abandoned: We’re on the Endangered Species List on the battle against climate change. Lifestyle expert, Suzanne Wexler, on changing wedding traditions. This week’s opening slate is presented by my dear sweet niece, Ayanna Scantlebury. We remember soap star Jed Allan, who passed away at the age of 84. 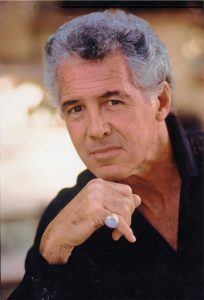 He starred in many daytime soaps, including Days Of Our Lives, Santa Barbara, General Hospital, Love Of Life, Secret Storm and more. Plus he was Ian Ziering’s TV Dad on Beverly Hills, 90210. He also wrote a memoir called Please, Spell the Name Right . Clint Moss is a Manitoba farmer who earned the Guinness World Record for creating the world’s largest snow maze. Stuart Nulman with another edition of Book Banter. This week’s reviewed title is American Prison: A Reporter’s Undercover Journey into the Business of Punishment by Shane Bauer (Penguin Press, $37) You can also read Stuart’s reviews in The Montreal Times. This week’s opening slate is presented by me, Peter Anthony Holder, host of The Stuph File Program as we mark the 500th episode. Clinical Forensic Psychologist, Dr John Huber, is back to talk about mental health and the healing properties of humour. Lorraine Justice, author of, The Future of Design: Global Product Innovation for a Complex World , discusses robots in the workforce. Stuart Nulman with another edition of Book Banter. This week’s reviewed title is I’m Dying Up Here: Heartbreak and High Times in Stand-Up Comedy’s Golden Era by William Knoedelseder (Public Affairs, $22.49). You can also read Stuart’s reviews in The Montreal Times. Stuart also mentioned a famed Denver bookstore called The Tattered Cover. This week’s opening slate is presented by Puelo Deir, a PR specialist who has worked on many projects. There are several Montreal shot movies coming out in 2019 that he’s publicizing, including Long Shot starring Charlize Theron; Pet Sematary starting Jason Clarke and John Lithgow; Midway directed by Roland Emmerich. He’s currently working on Dreamland starring Gary Oldman, Armie Hammer and Evangeline Lilly. Claus Böbel is a fourth generation butcher in Germany who just opened the Böbel Bratwurst Bed & Breakfast, an all bratwurst themed hotel. James Geary, author of Wit’s End: The Science, Psychology, and Soul of Wit . Dr. Nicole Kelly, author of Charming Cheaters: Protect Yourself from the Sociopaths, Psychopaths, and Sexopaths in Your Life , talks about sociopaths and psychopaths. This week’s opening slate is presented by Rick Blue, half of Canada’s favourite comedy musical duo, Bowser & Blue. They have a lot of upcoming shows including March 2nd at the Morrin Centre in Quebec City and March 30th for the 50th anniversary of Dawson College. Check their website for more dates.